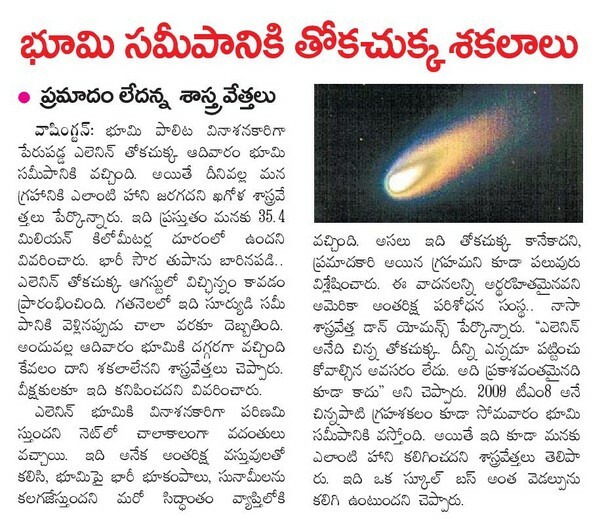 Friends here is an excellent opportunity to you ...You can attempt to answer these questions and mail us at planetarysociety.india@gmail.com ... Also see article published in Eenadu pg.3 today 17 Oct, 2011. Brief Note: Today at 1.21 a.m. Comet Elenin fragment were at its closest approach to earth and are reported to passby without any harm to us. Further a Asteroid called "2009 TM8" will pass from area between Earth and Moon at 4.38 pm. There is No harm to humans from any of these two objects ..
1. Is it true the fragments of Comet Elenin will pass by earth today …are at this moment from earth ? 2. What is comet Elenin ? 3. Who Discovered it? When was it discovered? 4. What is the size of this comet? 5. You said 2,00,000 km …don’t you think this comet will eclipse the sun ? particularly when it is between earth and sun ? 6. We heard about Comet Halley which returns every 77 years ? Can you give us overview of some prominent comets ? 7. Sir when will this comet return to our solar system again ? 8. Can we see this Comet with binocular? 9. Can a Comet be visible to naked eye ? In the past anyone seen them ? 10. Can you tell what exactly a Comet is? 12. Today asteroid (size of bus) is expected to miss earth ? Can you give some details of it . 13. You said this asteroid will pass between earth and moon? Will it hit us or moon ? 14. People talk about shooting stars ….How Comets are Different from Shooting Stars ? 15. 2012 Doomsday theorists are warning that this comet is nothing but Planet Nibru ? Which has come close to earth to destroy us ? What do you say ? 16. Is it true that Earth will plunge into darkness? 17. It is true that it will cause earth quakes ? 18. Are these particles going to fall on earth? 19. Will these material eclipse the sun? 20. When will the pieces of this comet return to earth? 21. What it the size of the present size of the fragments? 22. 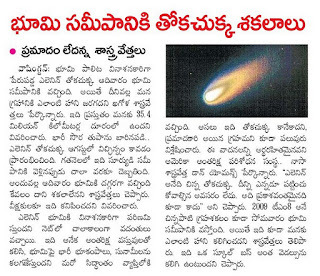 Is there any comet discovered by a Indian? When was it ? 23. Is there any comet named after a Indian ? 24. What are the famous comets ? 25. Is it indication or beginning of our end ….as it predicted by 2012 theorists ? 26. It is said that a comet is Bad Omen….In the history there are many incidents to prove this ? Even in a recent movie “Maghadeera” it is shown that a King looses Kingdom ? or Enemy attacks ? 27. Don’t you think the present situation in our state and country is due to this comet elenin ?